This Sunday will be a busy day at Evraz Place, with three events scheduled within a few hours of each other. Doors will open at 9 a.m. for the Remembrance Day service. The ceremony begins at 10:30 a.m. and runs until 11:45 a.m.
That will overlap with the annual Our Best To You craft show, running Nov. 9 to 11. On Sunday, the show runs from 11:30 a.m. until 5 p.m. Finally, the Saskatchewan Roughriders will host the western semi-final game at Mosaic Stadium. Kick-off is at 3:30 p.m., with gates opening one and a half hours prior. The busy area will mean limited parking spots for those who choose to drive. The parking lot has 3,500 spots and thousands of people are expected to attend the events. Staff at Evraz Place are prepared, but are encouraging people to look for alternative travel solutions, like the free Regina Transit bus service. 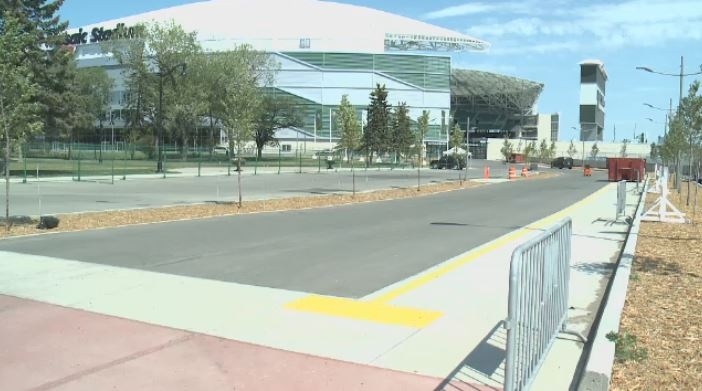 “Two hours and 15 minutes before the game, we have many buses, up to 60 buses, just continuously shuttling people to the stadium before the game,” said Nathan Luhning with Regina Transit. Buses are free to and from the stadium from five locations around the city. Other options include carpooling or getting dropped off to prevent a congested parking area.